To say it would be a coup to have a Cake Shop in Edinburgh would be an understatement. They are not short on offers but with Avalanche’s reputation combined with a location to die for it wasn’t too hard a sell. We are both well aware of the hard work needed to make any new venture a success even if it will be based in a well established shop and are very keen to talk to any interested parties looking to get involved especially on the sponsorship side of things. 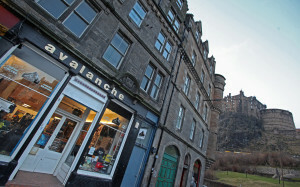 With locations in New York and Edinburgh the promotional opportunities are many and it goes without saying this would seal the Grasmarket’s claim to be the place to head for with so many amazing independent shops including the legendary Armstrongs for vintage clothing and Red Dog for musical instruments. At the moment we are still working out the details but are very interested to hear other people’s ideas. We would really like to get things going as soon as possible so may well have the Cake Shop as a pop up while we finalise the details to make the move permanent. Clearly this would be fantastic news for those more ambitious bands looking beyond the Edinburgh/Scottish scene and I’m sure our good friends in Glasgow and beyond would benefit too. Much more on this as soon as things are finalised.